This article is about the term for male servants. For the village in Iran, see Valet, Iran. For other uses of "varlet", see Varlet (disambiguation). A valet (or varlet) is a male servant who serves as personal attendant to his employer. 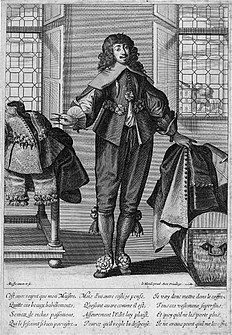 In the Middle Ages and Ancien Régime, valet de chambre was a role for junior courtiers and specialists such as artists in a royal court, but the term "valet" by itself most often refers to a normal servant responsible for the clothes and personal belongings of an employer, and making minor arrangements. In the United States, the term most often refers to a parking valet. In English, valet as "personal man-servant" is recorded since 1567, though use of the term in the French-speaking English medieval court is older, and the variant form varlet is cited from 1456 (OED). Both are French importations of valet (the "t" being silent in modern French) or varlet, Old French variants of vaslet "man's servant", originally "squire, young man", assumed to be from Gallo-Romance Vulgar Latin *vassellittus "young nobleman, squire, page", diminutive of Medieval Latin vassallus, from vassus "servant", possibly cognate to an Old Celtic root wasso- "young man, squire" (source of Welsh gwas "youth, servant", Breton goaz "servant, vassal, man", Irish foss "servant"). See yeoman, possibly derived from yonge man, a related term. The modern use is usually short for the valet de chambre (French for "room valet", in modern terms the bedroom, though not originally so), described in the following section. Since the 16th century, the word has traditionally been pronounced as rhyming with pallet, though an alternative pronunciation, rhyming with chalet, as in French, is now common. The Oxford English Dictionary lists both pronunciations as valid. A valet or "gentleman's gentleman" is a gentleman's male servant; the closest female equivalent is a lady's maid. The valet performs personal services such as maintaining his employer's clothes, running his bath and perhaps (especially in the past) shaving his employer. In a great house, the master of the house had his own valet, and in the very grandest great houses, other adult members of the employing family (e.g. master's sons) would also have their own valets. At a court, even minor princes and high officials may be assigned one, but in a smaller household the butler – the majordomo in charge of the household staff – might have to double as his employer's valet. In a bachelor's household the valet might perform light housekeeping duties as well. Valets learned the skills for their role in various ways. Some began as footmen, learning some relevant skills as part of that job, and picking up others when deputising for their master's valet, or by performing valeting tasks for his sons before they had a valet of their own, or for male guests who did not travel with a valet. Others started out as soldier-servants to army officers (batmen) or stewards to naval officers. Traditionally, a valet did much more than merely lay out clothes and take care of personal items. He was also responsible for making travel arrangements, dealing with any bills and handling all money matters concerning his master or his master's household. Alexandre Bontemps, the most senior of the thirty-six valets to Louis XIV of France, was a powerful figure, who ran the Château de Versailles. In courts, valet de chambre was a position of some status, often given to artists, musicians, poets and others, who generally spent most of their time on their specialized work. The role was also, at least during the late Middle Ages and the Renaissance, a common first step or training period in a nobleman's career at court. Jeeves, created in 1915 by P. G. Wodehouse, starred in a series of stories until Wodehouse's death in 1975; Reginald Jeeves is considered the "personification of the perfect valet" since 1930, inspired the name of Internet search engine Ask Jeeves, and is now a generic term in dictionaries such as the Oxford English Dictionary. Mervyn Bunter, created in 1923 by Dorothy L. Sayers in the Lord Peter Wimsey series, likewise a paragon of discreet competence, taking his duties beyond what was expected of a valet to help his master. Alfred Pennyworth, valet to Bruce Wayne (Batman), created by Bob Kane. Played by Alan Napier in the 1960s TV series and 1966 Batman film starring Adam West, Michael Gough in Batman, Batman Returns, Batman Forever and Batman & Robin, Michael Caine in Batman Begins, The Dark Knight, and The Dark Knight Rises, and most recently by Jeremy Irons in Batman v Superman: Dawn of Justice and Justice League. Originally a rotund domestic servant in comic stories, the role of Alfred Pennyworth has evolved to a technical and mechanical aide, highly skilled medic, and occasional wheelman for Batman on his various travels. Hobson (Sir John Gielgud), from the comedy film Arthur (1981). Kato, Inspector Clouseau's valet and martial arts partner in the Pink Panther movies. Kato, fictional sidekick/valet of The Green Hornet. Passepartout, in the 1872 novel Around the World in Eighty Days by Jules Verne. George (or Georges), created by Agatha Christie in the Hercule Poirot novels. Edward Henry Masterman, the victim's valet and a suspect in Agatha Christie's Murder on the Orient Express. Figaro, the Count of Almaviva's valet from Beaumarchais' play The Marriage of Figaro, as well as the Mozart and Rossini operas based on it. Leporello, valet of Don Giovanni in the opera by Mozart. Giles French (Sebastian Cabot) in the sitcom Family Affair. Probert (Derek Jacobi), valet to Sir William McCordle (Michael Gambon), and Robert Parks (Clive Owen), valet to Lord Stockbridge (Charles Dance), in the 2001 film Gosford Park, directed by Robert Altman. Baptistin, in The Count of Monte Cristo by Alexandre Dumas. Pork, Gerald O'Hara's valet in Gone With the Wind. Smerdyakov, the valet to Fyodor Pavlovitch in The Brothers Karamazov by Fyodor Dostoyevsky. Woodhouse, Sterling Archer's valet in the TV series Archer. "Spicer" Lovejoy (David Warner (actor)), millionaire Caledon Hockley's (Billy Zane) English valet in the 1997 film Titanic. Rochester van Jones (Eddie Anderson), the valet of Jack Benny on Benny's radio and television shows. John Bates (Brendan Coyle) first valet to Robert Crawley, Earl of Grantham (Hugh Bonneville) and Thomas Barrow, Lord Grantham's second valet in the Julian Fellowes period drama Downton Abbey. Planchet [fr], valet to D'Artagnan of The Three Musketeers. The Character "Valet" from No Exit by Jean-Paul Sartre. Sam Weller, valet to Samuel Pickwick in The Pickwick Papers by Charles Dickens. hotel valet — an employee who performs personal services for guests. parking valet – a service employee who parks cars for guests, only from 1960.
car valet — an employee who is paid to clean people's cars professionally. valet — a professional wrestling term for a person who accompanies a wrestler to the ring. Jockey's valet – an employee who maintains a jockey's wardrobe and ensures the proper uniform is worn for each horse the jockey races. Clothes valets are a piece of furniture also referred to as a men's valet. A majority are free standing and made out of wood. While in French this word remained restricted to the feudal use for a (knight's) squire, in modern English it came to be used for the various other male servants originally called va(r)let other than the gentleman's gentleman, when in livery usually called lackey, such as the valet de pied ('foot varlet', compare footman). In archaic English, varlet also could mean an unprincipled man; a rogue. ^ "Bartleby.com: Great Books Online -- Quotes, Poems, Novels, Classics and hundreds more". Bartleby.com. Retrieved 28 October 2014. ^ "pbs.org". Pbs.org. Retrieved 28 October 2014. ^ "imdb.com". IMDb. Retrieved 28 October 2014.